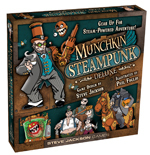 Daily Illuminator: Munchkin Steampunk Deluxe Preorder Available! July 30, 2015: Munchkin Steampunk Deluxe Preorder Available! Did you know you could reserve your copy of Munchkin Steampunk Deluxe, BEFORE it comes out? It's slated to be our biggest release of the year and copies will go fast, so the preorder is the best way to ensure you get your hands on a set. Featuring all-new art by Phil Foglio (Girl Genius) and exciting steampunk-themed action!